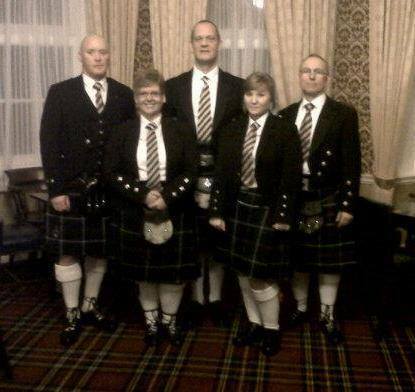 A Mini Band played at the Worksop Masonic Hall, Nottinghamshire, dressed in evening wear. This was a Burns night celebration. Julia and David played as the guests got seated. Robert played the top table into dine. Then came the address to the haggis which Alex did in superbly animated style, the like of which i have not seen before yet superb. We then played a selection of familiar tunes together after the formal toasts. Heather was on the side drum, she played exceptionally adding depth to the overall sound. We came off to a standing ovation and recieved many many words of approval from those present.